We tweak the menu each year, although our volunteers try hard to keep serving your favourites. “Whole pies” usually sell out early in the morning. Quilt bidders eat before noon, because that’s when the auction begins. Come early; some food sells out by early afternoon. Black Creek Pioneer Village opens at 10am; there’s lots to see and do (and eat)! 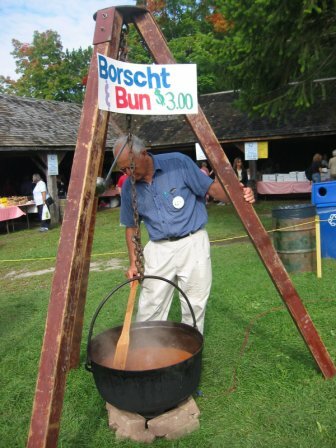 Can you please tell me whether there will be any gooseberry pies at the September 17th Toronto Mennonite Festival at Black Creek Pioneer Village? Good question; I will seek the answer! Joe, no gooseberry yet. Our pie team is looking for a recipe and a supplier of gooseberries, since we’re game to try almost anything once. I have bought frozen gooseberries at McMillans Orchards (locations in Acton and Whitby) which I use for making jam (so I know they’d be good for making pies).